PerformancePro ArtesianPro Low RPM is the pump you need to improve your energy efficiency! You get the safety and convenience of self-priming along with great energy savings. For ease of use, it provides a large strainer basket, and an easy open Lexan lid. The specially designed lid and clamp ring insure a positive seal with very little o-ring wear. Designed for quiet operation and enhanced performance the ArtesianPro has 3″ ports and a large capacity strainer basket accessible through our easy-open, clear Lexan lid. Quick connect fittings included with each pump provide direct connection to 2″, 2 1/2″ and 3″ pipe. 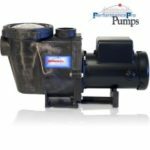 Impeller interchangeability allows you to easily change your pump’s performance. Top-of-the-line motors. All 1725 rpm units are totally enclosed and fan cooled for extended service life. 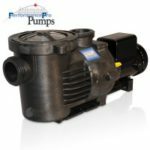 Safety first – out of the water (external) pumps help protect you from annoying and potentially dangerous oil or electrical leaks.